Yes I did say that I was going to talk about my old projects before talking about my current ones but I'm making no progress on my WIPs at the moment ( damn you SMS giveaway! ) 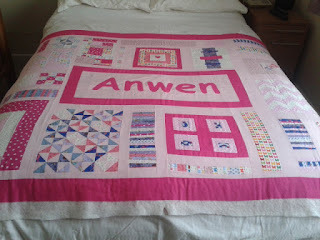 So I thought that listing them here would shame me into getting some sewing done! Pieced, backed, basted and ready to quilt (I even have the binding ready). As you can see the back isn't really a back it's more like an alternative front which means that the only quilting option I can think of is fmq. Only problem is I haven't fmq'd before and I've put so much work into this quilt top(s) I don't think it's the place to practice! Hence Get Shirty below! 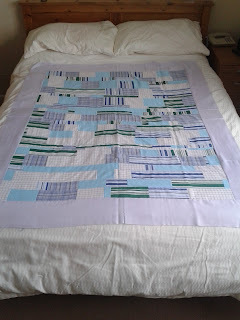 As you can see I started to straight line quilt it but then I ran out of cream thread. I did try switching to white but it stood out like a sore thumb. 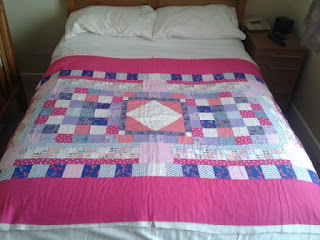 I put the quilt away until I got some cream thread- I got it two weeks ago but still haven't done any work on it - it sounds silly but I can't be bothered to change to my walking foot! 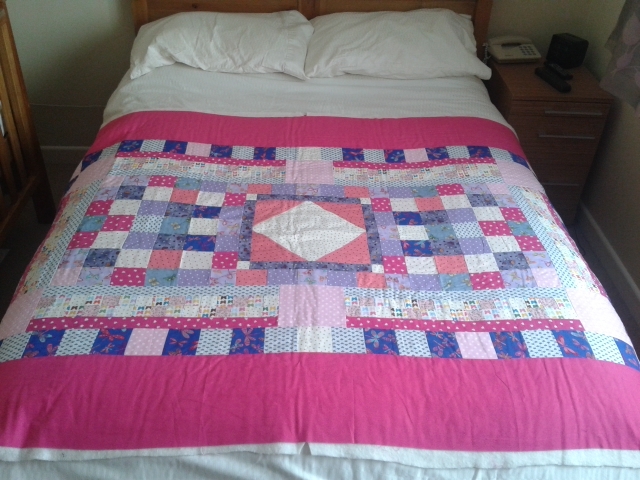 The quilt top is ready but I need to buy wadding. 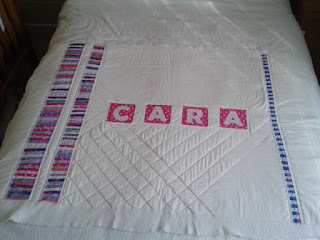 I've told myself that I'm not allowed to buy wadding until I've finished Cara's quilt! I also need to piece the backing. 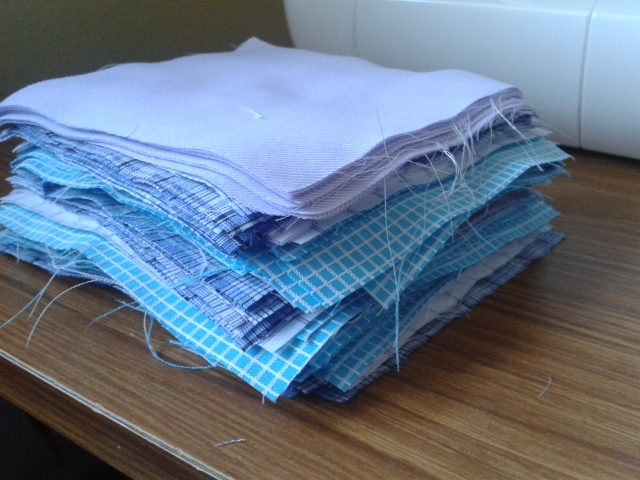 I've cut the 5x5"charms and I'm ready to start making some HSTs. On top of this I have a list of quilts that I want to start but won't let myself until I've made inroads on the list above. My boss and his girlfriend (that also works with us) have had a little boy. 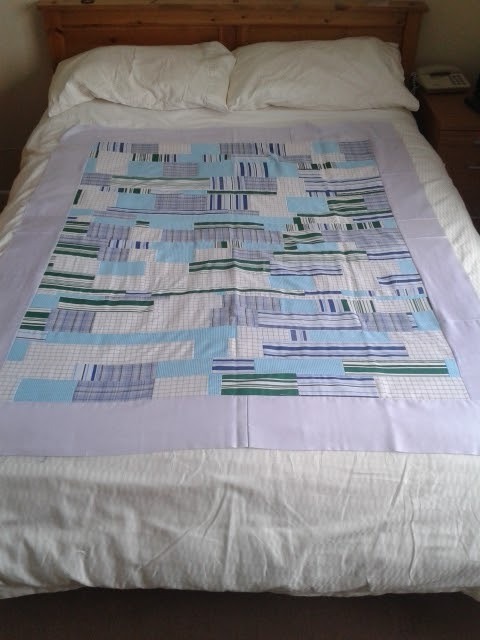 I have the perfect fabric for the quilt top and think that I'll try to get some blue print from Architextures for the backing. Really speaking as this will be a baby gift it should get priority but I don't want to add to my WIP list. My brothers girlfriend is pregnant with my first nephew (I currently have one niece thanks to my husband's sister). I've bought the fabric and know what design I'm going to use but haven't started yet - this baby is due at the end of July. We're going away on our yearly holiday next week. It's only four nights but my husband turns his phone off for the whole time (he's an electrician and has gone to work on Christmas day before!) which is pure bliss. I then have a normal week of just me and the youngest at home. A week of both babies at home (don't you just love half term?) and then I go back to work!!!!!!!!!! 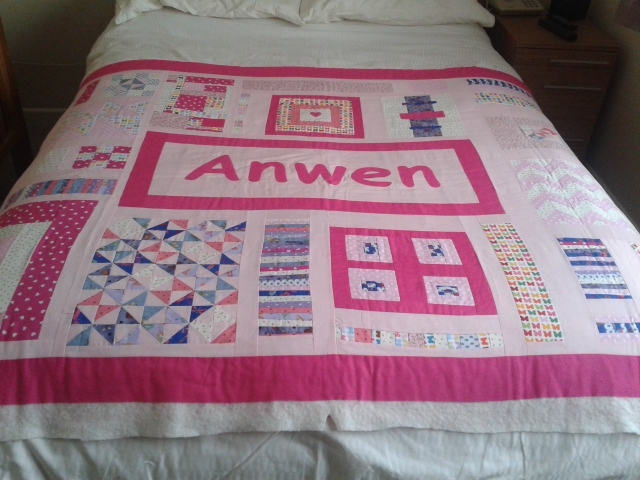 I really don't know how I'm going to find the time to sew when I work 30hrs a week and have two little girls to look after (the hubbie just about looks after himself!) but I know that I really have enjoyed getting back in touch with my sewing machine and don't want to part ways with her just yet. So watch this space. 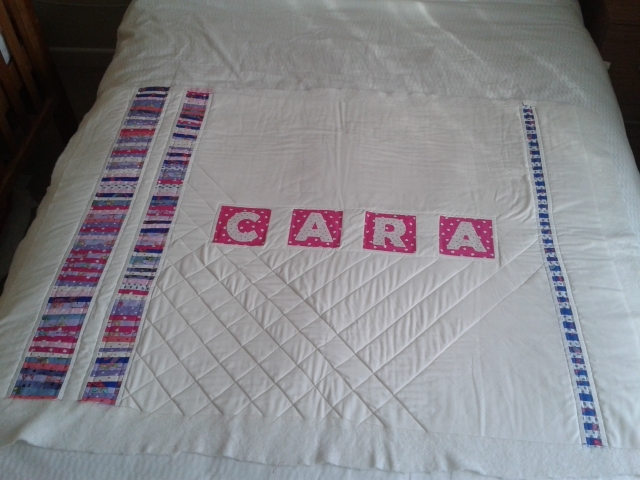 I hope that by the time I go back to work I'll have at least finished Cara's quilt and get shirty - here's hoping!